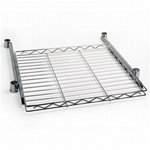 With over 50 different sizes and shapes of extra wire shelves, ranging from 8”x8” shelves for narrow spaces all the way up to wide, heavy duty shelves, Shelving.com offers exactly the right amount of storage for whatever space you need it for. These shelves can be paired with our wire shelving accessories to create custom shelving units, or can be added to existing wire shelves to enhance the storage capacity of any units you already use. All our shelves and racks are NSF certified for food and medical storage needs, and rated for up to 800lbs of storage. Contact us for more details, or request a free quote today.